When my daughter was little, her favorite Christmas song was always Rudolph the Red Nosed Reindeer. What kid doesn’t love Rudolph, right? That’s when we began making these easy mason jar crafts. She loved making them and they make amazing DIY gift ideas for kids to give! 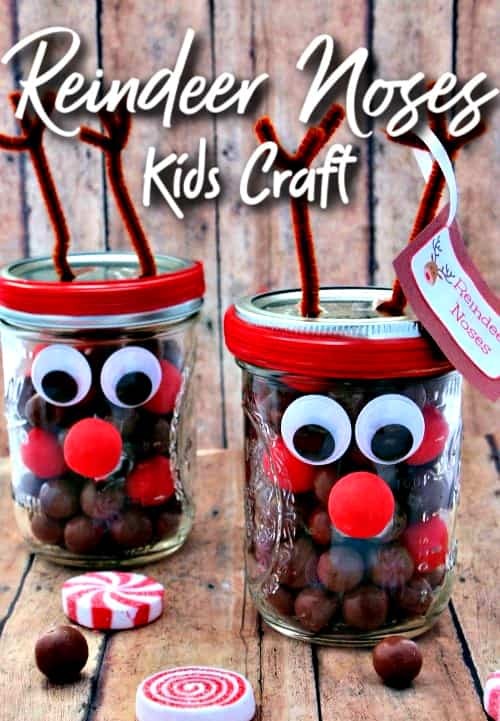 Plus, these Reindeer Noses are the cutest kids craft idea ever! These cute little mason jar crafts are perfect for even the littlest hands! They are the perfect kids craft idea for gathering around the table for family time. Older kids shouldn’t need too much help to piece these reindeer noses together. Since you will be working with glass mason jars, smaller kids should be fully supervised and will need help with them. 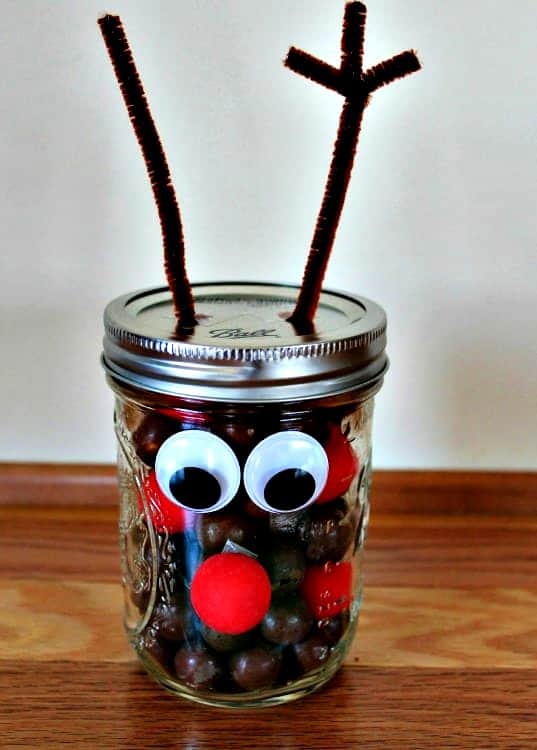 This kids craft idea is great to give as a DIY gift too! They’re perfect for giving to friends, family and even teachers! We have even included a printable gift tag for you to attach to your homemade gifts as well. You can use them or for a truly personal touch; create your own gift tags. These come together very quickly so they’re also perfect if you need to make several in a short time. Each one should take less than 10 minutes from start to drying time. Once they’re dry, they take less than 5 minutes to finish up. As I said earlier, we have created a printable gift label for you. 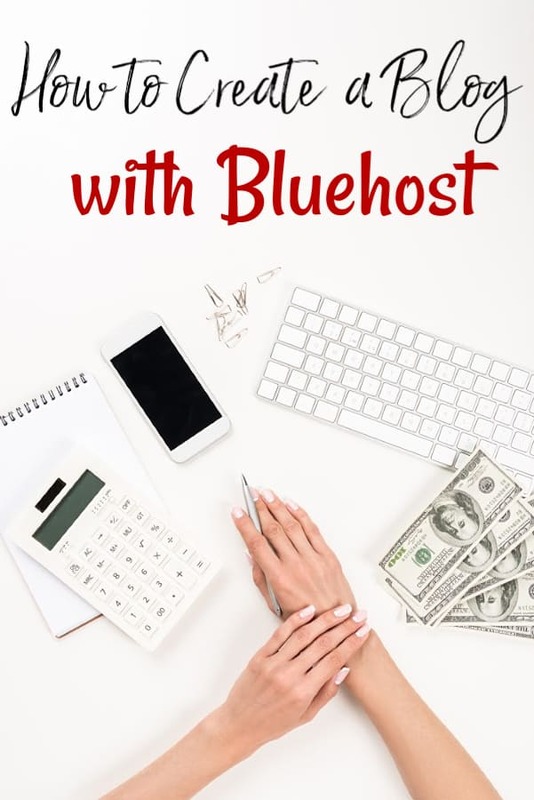 It is a PDF file that you can print off right HERE. Once you have it printed out, cut each square label out and glue onto a sturdy cardstock. Use a hole punch to put a hole in the upper corner and attach it to your mason jar craft with a Christmas colored twine. 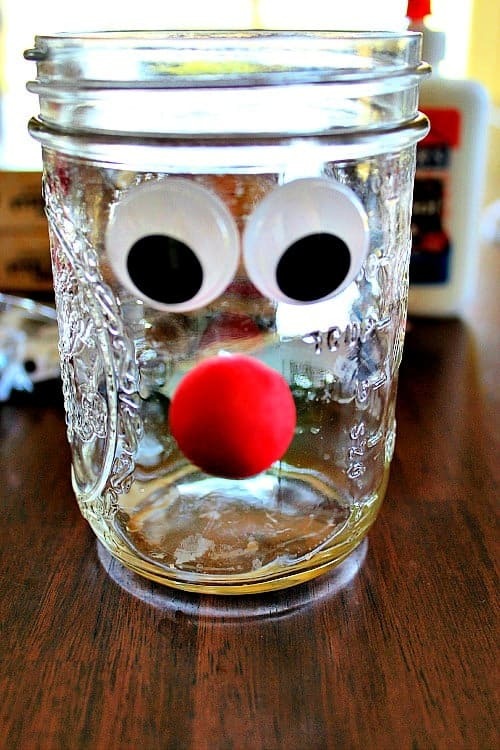 To start making your reindeer noses craft, wash the pint sized mason jars and allow them to dry fully. 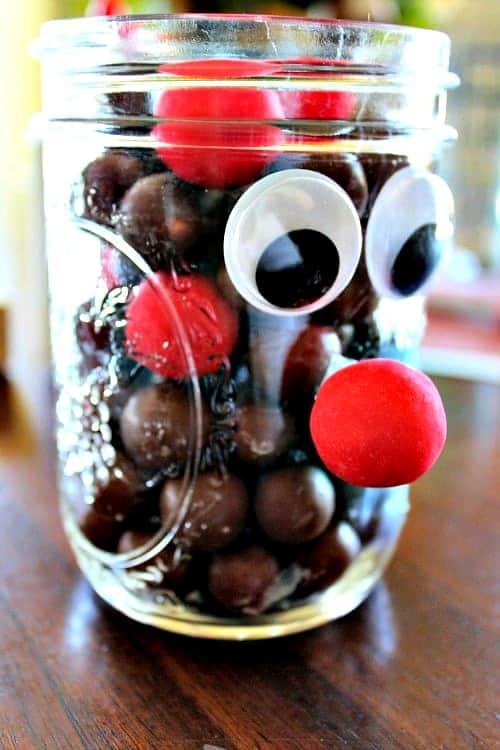 Once they are fully dry, turn them to the side without writing so you can make your reindeer face. 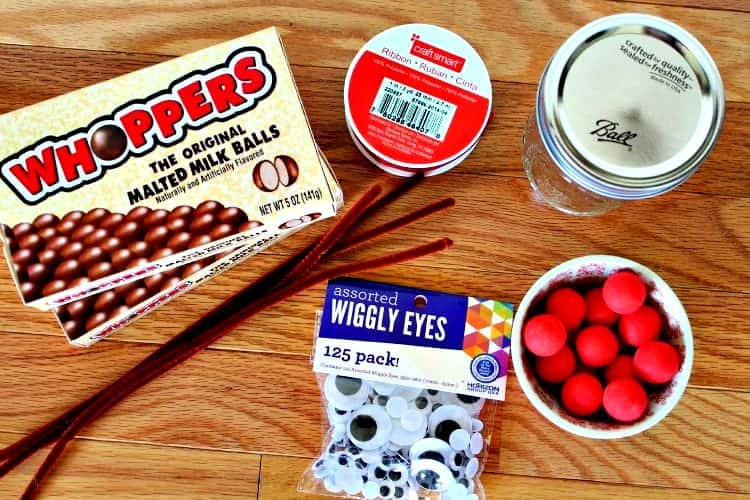 Using the hot glue gun or craft glue, secure the googly eyes and red gumball into place. Set each jar aside and allow the glue to dry fully before moving onto the next step. Once the glue is fully dry, fill the ason jar with Whoppers candy. Make sure you add the occasional gumball in the jar as well. These are supposed to be reindeer noses after all. Add a id and a ring once you have filled the jar. Next, you need to make the antlers. To do so, take a pipe cleaner and cut it into three equal parts. Glue one part of the pipe cleaner onto each side of the lid – like shown in the photo above – to make the stem of each antler. Allow each side to fully dry. Next, take the remaining piece of pipe cleaner and cut it in half. Twist one half around the stem of the antler to create the antler branches. Repeat for the other side. Once the antlers are done, add some pretty ribbon around the top of the ring and your gift tag. You’re done!